Listed by Homelife Benchmark Realty, Edith Katronis. Rosewood Park! Very private neighbourhood. This 2 storey, 3 bedroom home has views of Mt. Baker and the valley. Open concept living room, dining room and kitchen with 3 sided fireplace. Kitchen features ss appliances and gas stovetop. Large office/den on main. 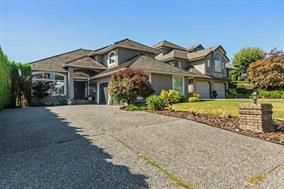 Very large master bedroom and 2 more bedrooms upstairs. Updated with newer windows, high efficiency furnace (2012), R60+ insulataion. Front loading laundry and security system. Sunrise School Catchment. Garage includes Stanley cabinetry. Large crawl space. Over 1000 sqft deck with built in gas line overlooking south facing beautiful backyard.